Transferred from the Office of the Administrator, Hospital of the University of Pennsylvania in 1979 (Accession 45-79) and the Nurses’ Alumni Association of the Hospital of the University of Pennsylvania in 2009 (Accession 2009:26). The collection is organized into two series, Board of Manager Minutes and Executive Committee Minutes, which are both arranged chronologically. In 1870 the University of Pennsylvania consisted of four departments – the College and the Schools of Engineering, Law, and Medicine – located in two buildings on the west of South Ninth Street, between Market and Chestnut Streets, in center city Philadelphia. In May of that year, the Trustees of the University purchased ten acres in West Philadelphia and began to build a new campus at South Thirty-fourth and Walnut Streets. A year later, under the leadership of William Pepper the medical faculty and alumni, accustomed to conducting clinical education in a hospital located near the University itself, petitioned the Trustees of the University to establish a University-owned and controlled hospital on the West Philadelphia campus. The Trustees readily agreed and in June 1871 formally established the “Hospital of the University of Pennsylvania.” In September 1872 the Trustees purchased an adjoining five acres as the site for the Hospital; in May 1873 the Hospital’s first building, designed by architect T.W. Richards, began to come out of the ground; and in April 1874 the Trustees celebrated its completion. In the interim, the Trustees provided for the governance of the Hospital by creating a “Board of Managers” in January 1874 and a month later, by beginning to appoint prominent Philadelphians to the Board. The Board was initially composed of eighteen members, representing four different constituencies. 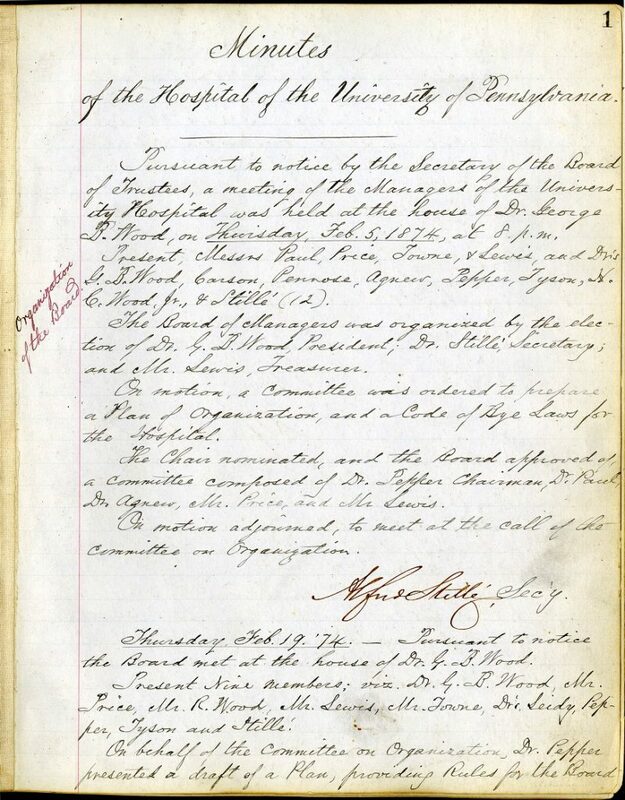 The Trustees of the University appointed five of their number, the faculty of the School of Medicine appointed seven, the Society of Medical Alumni appointed three, and the Contributors to the Hospital also appointed three. The Board of Managers held its first meeting on 5 February 1874 and elected Dr. George B. Wood the first President of the Board. The Board of Managers underwent only three structural changes during its ninety-eight-year history. In 1889 the Trustees of the University added a fifth constituency to those represented on the Board: the Board of Women Visitors who would appoint three of its number to the Board of Managers. In 1934 the Trustees reconstituted the Board of Managers by abolishing the constituency appointments and establishing in their place a self-sustaining Board of twenty members, only three of whom – a single member of the Trustees of the University, the Vice-President of the University in Charge of Medical Affairs, and the Dean of the School of Medicine – were ex-officio members. Then, twenty-five years later, the Trustees again reconstituted the Board of Managers by taking full control of the appointment of members and by stipulating that six of the members by so ex-officio: the President of the University, the Vice-President for Medical Affairs, the Dean of the School of Medicine, the chair of the Board of Medicine, and the chair and a second member of the Board of Women Visitors. This remained the composition of the Board of Managers until its dissolution in January 1972. The Board of Manager was given “charge of all the internal concerns of the Institution; the reception and discharge of patients, and the election of all subordinate officers for whose appointment other provisions [by the Trustees] is not made” and, after 1885, the training school for nurses. The appointment and supervision of medical staff was split between the trustees of the University and the faculty of the School of Medicine. In 1959, a Medical Board composed of the professional staff was established for the Hospital which had authority over decisions regarding the doctors and reported to the Board of Managers. In January of 1972, the University’s Board of Trustees replaced the Board of Managers of the University Hospital with the Committee on Health Affairs which would oversee and coordinate all policies and management of all hospitals run by the University. The collection documents the management and major planning and policy decisions undertaken by the administration of the Hospital of the University of Pennsylvania from 1874 to 1972. The minutes contain committee, administrative, and financial reports of the hospital, though the level of detail varies from time to time. Annual summary reports of the Hospital can be found in the published annual reports of the University Hospital (UPI 493), available at the University Archives from 1872 to 1962.